What Happens When A Diabetic Eats A Meal? For so many people with diabetes, no matter how hard they try… they just never seem to be able to consistently control their blood sugar. And carbohydrates are the single biggest macronutrient that people that trips people up. For most people, it comes down to mindset. But for some it comes down to a lack of information on the right choices. Eating right does take discipline. It does take consistency. But it doesn’t have to take teeth-gritted jaw clinching will power, if you do the right things most of the time. And when I say do the right things, I mean eat as healthfully as you can MOST of the time. Allowing yourself to be human SOME of the time. Or that French fries, pies, donuts, candy, cakes, sugary cereals, cookies, deep fried and processed foods… are going to make it hard to control your blood sugar. Well my job here is to provide you with the right information… but more importantly some simple techniques along the way to help you keep your blood sugar levels normal. The more you practice doing with these techniques and doing things the healthful way, the easier it will be to control your blood sugar and diabetes. When you eat a meal that contains carbohydrates, they are broken down in your body into glucose/sugar – the usable form of energy in your body. Carbohydrates impact your blood sugar the most of any other type of food. Proteins and fats have very little effect on your blood sugar. Simple carbohydrates are those closest to sugar, and they raise your blood sugar quickly after eating them – and complex carbohydrates (which includes starchy foods), take longer to raise your blood sugar. If you have a choice between non-starchy and starchy, starchy carbs usually raise your blood sugar more than non-starchy carbs. When you eat a meal that contains carbs (carbohydrates) your pancreas releases insulin into your bloodstream to remove the excess sugar from your bloodstream and store it for future use in the form of glycogen. When your glycogen stores are already full, that excess blood sugar is stored as fat. 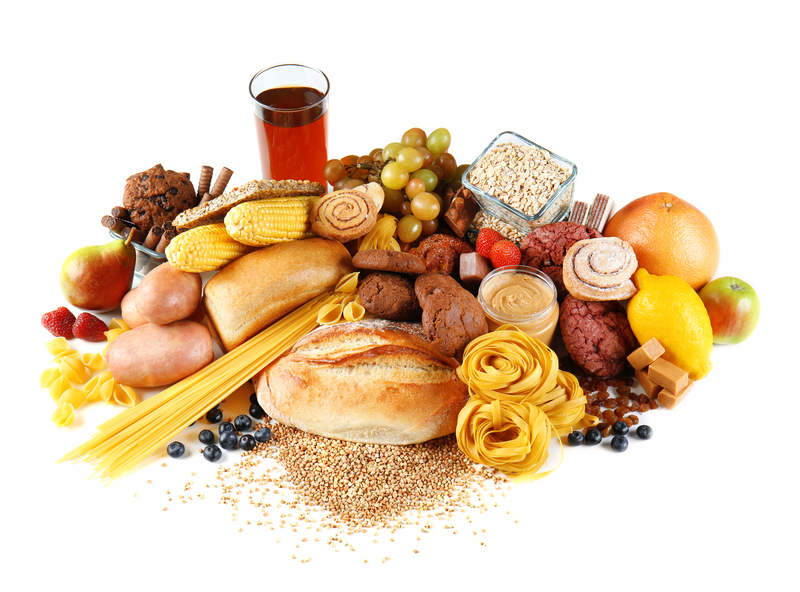 The type of carbs that you eat… affect how fast they are digested. Another factor is how much protein and fat you ate with your carbohydrate-rich meal. This affects the insulin response and how much of a blood sugar spike you’ll have. I always emphasize the quality of carbohydrates because they raise your blood sugar more than any other food. But not all carbohydrates are created equal. The more unrefined and fibrous the carbohydrate source, and the more protein and fat eaten with the meal, the slower the carbohydrate will be digested and the lower the blood sugar spike as well as the insulin response to the carbohydrates contained in the meal. Slow and steady carb digestion leads to steady energy levels, fewer crashes, and cravings. NOTE: Start to pay attention to how you feel after eating a donut or piece of cake all by itself. Then pay attention to how you feel if you had a meal consisting of a lean piece of meat, green leafy veggies and a starchy carbohydrate. The reason for crashes and unstained energy levels after low quality carbs is because heavily refined starches and sugars are stripped away of the fiber and nutrients… and are digested much more rapidly. This causes a bigger spike in your blood sugar and a crash after insulin has come in and cleared the excess sugar from your bloodstream. When you go through this roller coaster of up and down blood sugar spikes because of eating a lot of refined carbohydrates such as breads, low fiber sugary cereals, candies and other refined carbs… these spikes and crashes not only keep you feeling lousy, but they make diabetes worse. For diabetes I think there is a lot of material out there that offers quick-fix solutions. But I think the glycemic index is one solution that has plenty of long-term benefits. And ultimately, if you want to control your blood sugar for life, you’ll want to get accustomed to knowing the GI of foods to the point where it’s second nature. You’ll want to eat carbs that have a low glycemic index… Think of the glycemic index as nature’s natural time release. There is a ton of information on the glycemic index out there. It’s endless. You have glycemic index diets, charts, plans, tools, counters, shopping guides, and handbooks. One thing is for sure, so much material is available on this subject for a good reason. It works! The glycemic index of the foods you eat, play an important role in the fluctuations in your blood sugar. The glycemic index measures how quickly the foods you eat (mostly carbs) get converted to glucose. Your body uses glucose as a source of energy. For foods that are converted into sugar more quickly, they will have a higher glycemic index rating or number and foods that have a lower score or rating, are those that are converted to glucose more slowly. Remember what we talked about quickly digested carbs which spike your blood sugar, are not ideal? We want foods with a lower GI. These give you a steady blood sugar and insulin spike, reduced crashes and sustained energy levels. For a type 2 diabetic, the foods that are converted to glucose more slowly provide more benefit. When glucose is converted slowly it causes slower glucose spikes, which leaves you feeling full for longer. This is a key component that can help you control weight also. When glucose is converted more rapidly this causes a more rapid glucose spike after a meal, which is what we don’t want with type 2 diabetes. This also makes you feel hungry quicker and crave more carbs, since these foods are so quickly converted to glucose. Also, to make things worse a type 2 diabetic is usually insulin resistant so blood sugar may continue to rise after each sugary meal. A food like a donut has a glycemic index of 76. While a food like kidney beans has a glycemic index rating of 27. A fruit like blackberries has a glycemic index of 25 compared to a pineapple, which is 56. Keep in mind that sugar has a glycemic index of 100. So the idea is to eat foods with as low of a glycemic index rating as possible. Because a food like a donut is quickly converted to glucose and spikes your blood sugar very quickly. For diabetics, the idea is to swap out foods with a high glycemic index with foods that have lower GI. Over time, this is how you effectively use the glycemic index to naturally control your blood sugar with the foods you eat. Foods that have a lower GI include most green leafy vegetables, and nutrient dense fruits. Instead of focusing on grains, focus on the right fruits, veggies, nuts, meats and eggs. The key to remember is that while the GI and other resources have their place, the effect that foods have on your blood sugar can change based on the foods that they’re eaten with. This is why, I recommend having a balanced meal when eating carbohydrates. In other words, almonds with an apple and a serving of cottage cheese will have a different impact on your blood sugar than having an apple all by itself. The higher a food is in fiber, the slower the blood sugar response of that food. These carbs have the highest fiber content and are some of the best carb sources for better blood sugar control. Not to mention, fiber aids in speeding up your metabolism. This is key when it comes to weight loss. In a perfect world if you can get all your carbohydrates from the right fruits and vegetables and limit other forms of carbohydrates… you’ll be much better off in terms of controlling type 2 diabetes. For example, if you normally have oatmeal with blueberries for breakfast with eggs, eliminate the oatmeal and just have eggs and blueberries for breakfast. Your body needs carbohydrates. Think of this as a way of life. I don’t recommend limiting any one type of macronutrient. Macronutrients include, fats, proteins and carbohydrates. Instead, I prefer using effective strategies and techniques for eating healthier and as a result controlling and improving diabetes. I don’t recommend that you limit one over the other. Instead, I recommend healthier choices for each macronutrient. Instead of limiting carbs, choose unprocessed carbs instead. you wake up in the morning to get your metabolism cranking. If not, your metabolism is running much slower than it should. Remember to include all three nutrients fats, proteins and carbohydrates on your plate. When it comes to type 2 diabetes, carbohydrates impact your blood sugar more than any other type of food. That’s why it is so important to utilize resources like the glycemic index and recognize that not all carbohydrates are created equal. If you really want to create lasting change for yourself when it comes to managing diabetes focus on increasing your fiber content, while also choosing carbs that aren’t heavily processed. By following this short guide… you’ll be well on your way to reducing blood sugar spikes, while enjoying sustained energy throughout the day and feeling great. Prior to using any of this information, please consult with your physician.